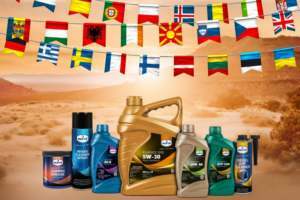 Eurol Motorcycle Fuel Treat | Eurol B.V.
Eurol Motorcycle Fuel Treat is developed to protect your petrol powered machine against gum, varnish, rust and corrosion throughout the fuel system. Petrol consists of a complex mixture of hydrocarbons which is very sensitive to light and air. Petrol without any antioxidant is prone to oxidation and gum formation. Stagnant petrol only keeps for approximately 3 months when it is left unprotected, all the while lowering the octane number (RON). Oxygen negatively affects gasoline, changing the molecular structure in such a way that the octane number is lowered. Eurol Motorcycle Fuel Treat can prevent deterioration of petrol during seasonal or longer storage by improving oxidative stability. Petrol containing ethanol (E10) is especially subject to absorbing atmospheric moisture, then forming gums or solids. When that water mixture gets into a carburetor and rubberized parts, corrosion becomes a real problem. The 100ml bottle of Eurol Motorcycle Fuel Treat is recommended for use in 15L to 25L of fuel. Allow the Eurol Motorcycle Fuel Treat to run through the fuel system for up to a few minutes to ensure a proper treatment and not just the fuel stored in the fuel tank. Add the Eurol Motorcycle Fuel Treat to the fuel tank before refueling. For best results, use when your fuel is likely to sit for more than one month. Users should consult the Material Safety Data Sheet of Eurol Motorcycle Fuel Treat for information about storage and shelf life. Please ask Eurol Research & Development if any further information is required.